Most popular | Canary Wharf 2009 | squashblog is 2 | Nick & Jenny in the mirror | What's rocking squash? Congratulations to the PSA on its recent agreements in Kuwait and Saudi Arabia that will bring some great tournaments to the region. Most importantly for the game are the large prize purses: the four Super Series Platinum events to be held in Saudi Arabia are worth more than $1 million - the size of the deal being a first for squash. This should not only raise the profile of the sport in the region but hopefully attract press coverage from further afield. Olympics: squash funding to suffer? 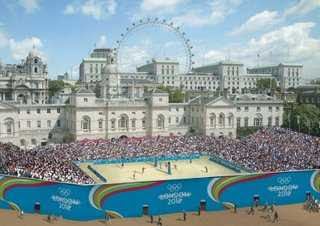 I was as disappointed as everyone else when squash failed to make it into the 2012 London Olympics. An article in the Guardian this week listed "20 reasons to be cheerful and 12 reasons to worry about the Olympics" - one of the "worries" being that "Non-Olympic sports are likely to suffer as Lottery cash is siphoned away to the games". The prognosis for squash events in the UK looks good. UK Sport are contributing £152,000 towards the costs of staging the 2008 World Squash Championships in Manchester - the money being made available through their Lottery-funded World Class Events Programme, which "aims to secure sporting events of strategic importance in the UK". The Sport England website gives greater information on squash funding but its contribution appears to end 2005/6 (is this because the document is old?). As a "priority sport" squash receives "National Investment". The second funding stream is called the Community Investment Fund - this is the Lottery funding available through and managed by the regional offices of Sport England. It is this second stream of funding that would suffer if Lottery money was diverted towards achieving British success in Olympic sports in 2012. "The information on the site appears to be out of date. Apologies for any confusion. England Squash are a designated Sport England priority sport and are currently delivering a four year business plan (2005-09) to meet certain objectives around increasing participation in the sport and also the around performance elements of the game. They receive £1.5m per year to achieve these goals. The plan is available on the England Squash website ..."
Unfortunately England Squash's Whole Sport Plan 2005-2009 seems to have its budget section missing, so it is unclear whether they receive any direct Lottery support through the Community Investment Fund. I have contacted England squash and am awaiting a reply. Can anyone shed any light on whether a drop in funding is a distinct possibility (as the Guardian article suggests) or, indeed, is already happening? Take a look at the fantastic pictures of the University Club of Chicago - currently playing host to the Windy City Open 2007. 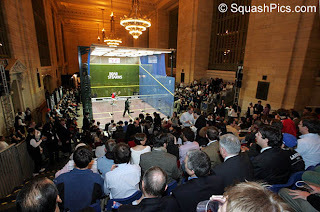 Other eye-catching venues at which the PSA have held big tournaments include Grand Central Station in New York and the pyramids at Giza. I remember a while back that a Brighton Beach event was scheduled but it didn't come off. Shame, as I'm sure it would have been a great success. Deciding to stage an event at a venue like the UCC again emphasises the "portability" of squash events - an advantage that the sport has over others. Are gyms really to blame? 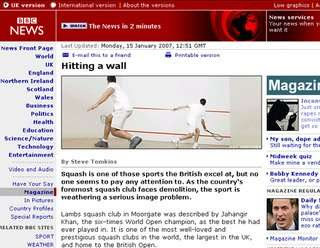 An article on the BBC website this week highlighted squash's image problems through the microcosm of the Lambs club closure. Steve Tompkins' piece included quotes from Peter Nicol and promoter Alan Thatcher, and drew many votes of support from readers who were similarly incredulous that the sport does not receive the status it deserves. Many responses cited a drop in participation as a result of sports centres replacing squash courts with more lucrative fitness suites. While this reason is sadly true to some extent, it does not address squash's "image problem". It would be fanciful to claim that there is a currently a fitness boom that warrants this kind of redevelopment of sports facilities: statistics about obesity and the success of tv programmes such as Jamie's School Dinners suggest that the British public (at all ages) are not exactly ditching the sofa for the treadmill en masse. 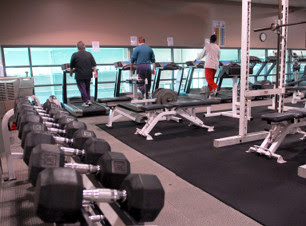 The rising number of gym memberships in the past decade is almost certainly due to a rise in disposable income across society, though I would hazard a guess that membership does not always result in regular attendance (how many join through guilt after a weekend binge, or especially post-Christmas?). The ability to pay for expensive memberships has been successfully exploited by marketeers who recognise an increasingly image-obsessed society. Therefore blaming the existence of one physical activity/hobby for the decline of another seems misplaced. After all, rowing machines and treadmills were around in the 1980s at the height of squash's popularity, and did not hurt squash's success then. Rather than target sports centres and developers for what are sometimes hard business decisions made in an era of extraordinarily-high property prices (although I concede that publicly-funded centres have a remit to provide access to a wide range of activities), surely those who care about the future of the sport need to look closely at how squash is marketed by contrasting it with other successful sports/pastimes. This requires a co-ordinated marketing strategy underpinned by - almost certainly - a greater injection of cash from governing bodies. In this way we can learn something from the gym companies, rather than become simply resigned to dealing with the consequences of the decisions they make. Resurgent British Open - but where's Ramy? The purpose of squashblog is to help raise the profile of squash through dialogue with the squash community, the media and other agencies. Primarily the site should be a platform for those who care about squash to discuss the issues around its development, such as its image, its use of the media, Olympic aspirations, marketing and sponsorship. The blog postings that I write are to stimulate debate, and by providing opinion rather than solely news-based articles I hope to provoke readers into suggesting how squash might tackle some of the issues mentioned above. All postings can be commented on - anonymously if preferred - and any ideas for new topics of discussion will be welcomely received. Send your ideas here. Thanks to squashpics.com for the use of photos.